House training, house breaking or potty training, no matter what you call it, helping your new puppy learn not to mess inside its home and crate are essential goals for all new owners. Want the quickest success? Get a crate! A crate is the best tool to assist in potty training your new puppy. In addition to having the right tools, establishing a timeline to follow will make potty training as routine as clockwork. Each day begins the same for you and your puppy. When the alarm clock goes off, get up and get your puppy out of the crate and outside to do her business. Don’t stop to make coffee, check emails or potty yourself. Keeping the crate in or near your bedroom lets you hear a whimper or a whine if she needs to go out during the night before the morning. When she is still little, you may be able to get her out of the crate and pick her up and carry her outside. This will prevent her from stopping and peeing on the floor on the way to the door. This is also helpful for the puppy that is not completely collar and leash broken. Establish this routine early in the puppy’s life, as it will last for the lifetime of the dog. Another morning ritual will be breakfast. After you take her out to go potty, she will be ready for her first meal of the day. Try to keep this scheduled at the same time each day. This will aid in her regular elimination and you can set your watch to potty time. After the meal wait 5 to 30 minutes to take puppy outside after they eat. The younger the puppy the sooner you should take them out after a meal to potty. As the puppy grows older they will gain bladder control and learn to hold it longer each day. Most puppies eat three to four meals a day when they are growing. So following this wait period after each meal will be key. Most puppies will have to poop after meals. Also watch when they drink large amounts of water. 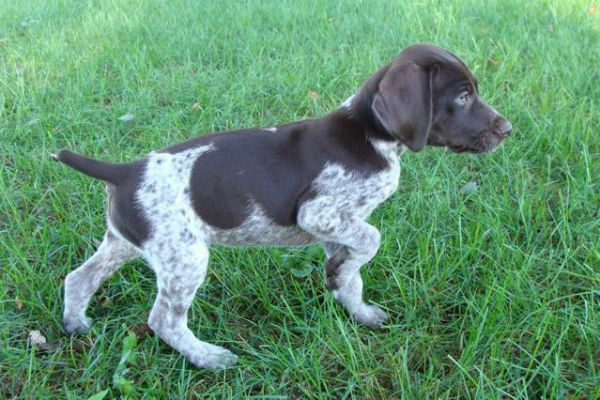 If your puppy drinks a big bowl of water, treat this just like a meal, and take her out to potty soon afterwards. There are a few other times that puppy will need to go potty beyond first thing in the morning and after each meal. These are naps and playtime. Naps are mini versions of the getting up in the morning routine. Make sure that when your puppy is sleeping either in her crate or out on the floor while you are watching TV at night, that the moment she wakes up take her outside. After playtime is another time puppy needs to go out and potty. The stimulation of the digestive tract brought on by playtime will also give her the urge to want to have a potty break. Other clues that puppy needs to go out, and these can be very random, include sniffing the floor or carpet, wandering around the house, especially in rooms far away from the family, and whimpering. If you see any of these signs, take her out immediately! 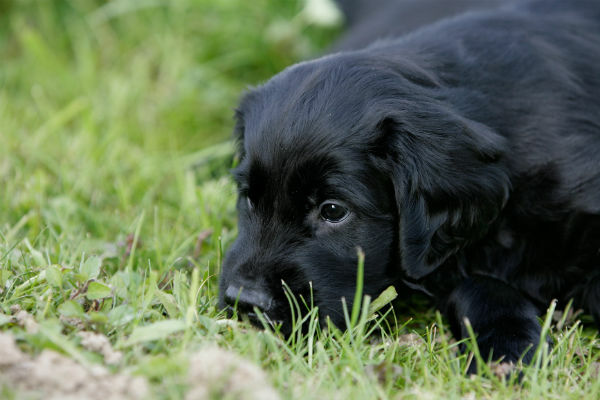 Once you have established the routine of taking puppy out after sleeping, eating and playing it’s time to focus on what to do once you are outside. Find a spot that will become the “potty spot” and always, take her to the same spot. As you approach her spot, give her a voice command or signal, to “Go potty” or “Do your business” then wait for the results. Praise lavishly for results! Say “Good Girl!” and then give her a yummy treat. Do this every time you are outside (or if indoors using puppy pads or dog litter boxes) and soon enough the puppy will understand that doing her business as a result of your prompting to her spot will bring her lots of love and treats. Remember if there are accidents indoors, do not punish your puppy, simply clean up the mess and ignore the puppy. If you catch her in the act, say “Go outside” and pick her up to finish her business outside. Many owners have great results by also placing a bell on the door handle where they always ago out to do potty. Puppies can be taught to ring the bell each time they want to go out. Again, ring the bell as you exit and praise the puppy once it starts to ring the bell on its own. When you have to leave home for several hours and your puppy needs to stay in a crate during the day, remember to plan ahead. How long can a puppy hold it? Use the month plus one rule. Take the age of your puppy in months, add one and that is the maximum number of hours that your puppy should be able to comfortably hold it between potty breaks. A 3-month-old puppy plus one equals 4 hours that she should be able to stay in her crate without a mess. Just like when you wake up in the morning, don’t forget that the last thing you should do before you go to bed for the night is take your puppy out for a walk and it’s last potty break before bedtime. By scheduling meals, walks, playtime and other activities in a daily routine, you and your puppy will be your way to success in potty training. Good Luck! For more help potty training your pup, check out the video below.